Second time lucky. Members of the European Parliament yesterday voted by 436 to 241 in favour of adopting a common position on the Transatlantic Trade and Investment Partnership (TTIP). Parliament’s support comes on the condition that the investor-state dispute settlement (ISDS) mechanism be replaced by another system, but many observers remained sceptical as to whether this will be possible. Unlike the June plenary session, a vague consensus began to emerge within the main political groups around Bernd Lange’s TTIP report. But the debate in the hemicycle was heated, and a number of amendments were submitted. “We have worked hard since last year to make the agreement as transparent as possible. Progress has been considerable,” said Bernd Lange, the German TTIP rapporteur. Wednesday’s debate threw the divide between TTIP’s diehard opponents and the more measured, silent majority, into sharp relief. Most of the committee chairs expressed their support for the commercial agreement, for a wide variety of reasons. Francisco Jose Millan Mon, from the Committee on Foreign Affairs, stressed the geopolitical implications of TTIP and echoed the sentiment of Trade Commissioner Cecilia Malsmström, who believes the EU “needs an ally because we know that the strength of our voice in the world is, in relative terms, decreasing”. “The agreement will allow us to bring the United States closer to us. The challenges that we face in the Mediterranean should bring us closer to our natural ally,” the committee chairman said. Arne Lietz, a member of the Development Committee, insisted that trade and development policy must go hand in hand. “We should carry out an analysis of the effects of TTIP on development. We have too little information on the impact it could have, there have not been enough detailed studies,” the MEP said. According to a study by the German IFO institute, developing countries could benefit from the agreement, as increased economic growth in the EU and the United States would also increase demand for products and services elsewhere. Not everyone agrees. Developing countries today benefit from preferential access to European and US markets, but this may be eroded by an EU-US agreement, according to a study by Belgian NGO CNCD. Danish MEP Jeppe Kofod, from the Industry Committee, told his peers that an outright rejection of TTIP was not a viable solution, but that the EU needed a strong declaration of its position. The Environment Committee expressed concerns over health and environmental aspects of the deal, as well as the arbitration system. “We have certain concerns over standards: for beef, cloned meat, concessions on water and public health, ISDS. The proposed compromise is not enough!” Green MEP Bart Staes said. Jerzy Buzek said that a successful treaty would see energy prices converge on both sides of the Atlantic. “We need liquefied natural gas from the United States,” the MEP said. But he accepted that Europe’s carbon restrictions may hinder international competitiveness. Finally, the Agriculture Committee agreed that TTIP would improve access to American food markets, but stressed that European standards must not be compromised. Despite broad support for TTIP in the committees, many MEPs are less enthusiastic about the trade deal. 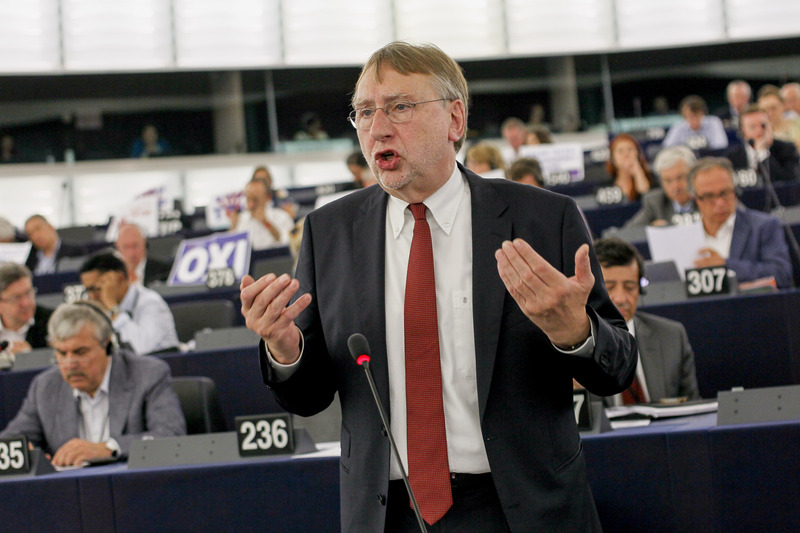 Left Front MEP Patrick Le Hyaric asked on Tuesday 7 July for the negotiations to be suspended in the wake of the latest revelations of NSA spying on European leaders. He also bemoaned the continued inclusion of ISDS in the latest version of the Lange report, arguing that this would lead business rights to “triumph over human rights”. The issue of dispute settlement between investors and states, which has been the most contentious point in the negotiations, was finally adopted by 447 votes for to 229 against, with 30 abstentions. The final compromise calls for a new public legal structure to replace the investor-state dispute settlement mechanism. But opinions are divided on the subject. Within the S&D group, but also among the Greens and GUE/NGL, many MEPs believe the new text, which suggests establishing a specific arbitration court for EU-US conflicts, is insufficient. The European Heart Network and the European Public Health Alliance said "It is essential that EU trade agreements do not limit the ability of national governments to legislate to protect and promote health and prevent negative health impacts such as cardiovascular diseases, especially heart disease and stroke, and related risk factors." Dutch MEP Marietje Schaake (ALDE), said, "We have listened to the concerns and interests for citizens, civil society and business, especially SMEs, and formulated a document along those lines. This is an interim report, as the negotiations are likely to go on for years. At the end of the process, the Parliament will be able to say yes or no to an agreement, so we will keep the negotiators to their promises." Tim Bennett, Director-General/CEO of the Trans-Atlantic Business Council (TABC), said, "The protracted analysis and deliberation by so many Members of Parliament is testimony to the fundamental importance and widespread impact of a possible TTIP agreement on the transatlantic economy and the EU market. Disagreements and concerns arise during the conduct of any major trade negotiation, but this particular agreement is critical at this point in history not just for the EU and U.S., but also as a positive signal to the global trading system." Natacha Cingotti, Friends of the Earth Europe trade campaigner, said, “The people of Europe are rightly concerned about the threat TTIP poses to our environment, food, health and social protections – they expected the European Parliament to take a strong stance but MEPs have sided with big business and put democracy at risk by supporting these talks. The parliament has backed dangerous propositions within TTIP such as special privileges for foreign investors and plans to permanently align existing and future rules between Europe and the US which would lead to lower environmental, food and safety standards. Negotiations between the United States and the European Union on the Transatlantic Trade and Investment Partnership began in July 2013. The guidelines stated that the EU should seek to include provisions on investment protection and investor-state dispute settlement (ISDS) in the proposed agreement. The deal could save companies millions of euros and create hundreds of thousands of new jobs on both sides of the Atlantic. The average European household could save €545 per year and European GDP could increase by nearly 0.5%. Brussels and Washington want to conclude the ambitious negotiations and seal the deal by the end of 2015.